The CALIFORNIA AIR TOOLS 60040CAD Ultra Quiet & Oil-Free Air Compressor is designed to be one of the quietest 4.0 Hp air compressors in the industry having only 75 decibels of sound. The CAT-60040CAD Air Compressor has a Oil-Free Dual Piston pump designed to have a life cycle before wear of 3000 Plus hours compared to other comparable air compressors. The large 60 Gallon Steel Air Tank is just the right size for shop or garage. Designed for the person looking for Power, Air Flow and Less Service with at Least 30% Less Noise! 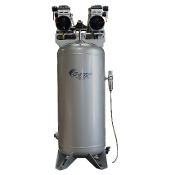 eliminate manually draining your air compressor air tank. This product has Blemishes such as paint discoloration. Shipping: Free Shipping - Item shipped on a pallet. No upstairs or inside deliveries.